We believe that our prudent investors benefit from thoughtful research. Why? Because when markets become threatening a deep analytical toolbox gives investors more tools to manage risk and therefore safeguard client wealth. One of the most valuable of these tools is to invest in securities that benefit from disorder, what Taleb describes as “Anti-Fragile.” Such investments help us to get long the solution rather than short the problem. Today we do a deep dive to explain one such investment that can profit from the rise of credit distress that kills bull markets. We will examine why we think the company’s recent blowout results are a canary in the coalmine for the second longest upcycle on record. English scientist John Scott Haldane was the first to introduce canaries into coalmines in the 1890s. He had often been called upon to investigate lethal coal mine disasters. During his investigations, he noted the bright red skin of the victims, which he soon realized came from carbon monoxide poisoning when this toxic chemical replaced oxygen in their bloodstream. His advice was for miners to carry with them canaries in small cages as useful “sentinel species” in coal mines. Their faster metabolism reacted more quickly than that of humans to higher levels of carbon monoxide. When the canary died, miners still had time to evacuate. Those who must navigate an uncertain market understandably seek out their own coalmine canaries. The investors’ goal is to answer one of the hardest questions in the investing world: “where are we in the cycle?” This motivation is like Charlie Munger’s desire to know where he will die, so he will be sure to never go there! It’s an understandable desire to seek to remain fully invested during a bull market and to get out the day it’s over. Unfortunately, such perfection lies beyond human talent to achieve. Mortals can, however, use tools such as changing asset allocations in an aging market to own safer assets, such as bonds. These changes we have made, including those we discussed just a few weeks ago to make portfolios safer. Most portfolio hedges are “shorts” which profit when a stock falls in price when disorder arises. This trade structure has several shortcomings. First, a short can only fall to zero, earning you at most a 100% return even if your insights and timing are perfect. Second, the more right you are, the more quickly the position becomes irrelevant to the incremental returns of the portfolio because a short position shrinks in size if it goes in the intended downward direction. Third, if a short works against an investor by rising in price, it can become an open-ended liability that grows to be an ever-bigger problem if it continues to work against you. This can lead safety-minded investors who practice rigorous risk-management to reduce the position when the correct fundamental assessment is to add to the position. Finally, time is not the friend of the investor who shorts, as there is a price he must pay to borrow the security while he waits to profit from its decline. For these reasons our research is focused upon what we believe to be a more elegant solution of identifying securities we can own that profit from disorder as simple unleveraged longs. We believe this trade structure is superior because the more right we are, the more the portfolio benefits. The returns of a long may be unlimited, while even the best shorts can only return 100%. Also, should our insight prove premature and the stock or investment that we own works against us, the position becomes smaller and thus less worrisome among our portfolio holdings. This is better natural risk management and makes time our friend, not our enemy. These are simple concepts, but they are important and profound. Do not underestimate the difficulty of executing these steps. Our experience is that the rewards for those who get trade structure right are worth the trouble! You can read more about how we use this principle to get long solutions in higher quality bonds (August 23, 2017) and select gold-related equities (August 20, 2014). The chart below demonstrates why we believe the stock of FCN could be an elegant trade structure for a complex problem: how to protect and diversify portfolios against the early indicators of market-killing credit distress that we could reasonably expect would call an end to this long upcycle. The green line shows the performance of FCN relative to that of the S&P 500 Index on the left axis. On the right axis, the blue line tracks the performance of a credit default swap (CDS) that hedges against default on an index of investment grade bonds. The chart clearly shows how strongly FCN has outperformed the market during prior periods of rising credit distress. In early February of this year credit distress re-entered the world, although admittedly from a low base. FCN accelerated dramatically upon the release of its latest quarterly numbers. Below we explain why. FCN’s Antifragile Businesses Profit from Credit Distress and Rising Disorder. FCN is a consulting company headquartered in Washington DC, with a $2.2 billion market capitalization. Among its five divisions, we believe two are remarkable for their counter-cyclicality, because their fundamentals improve with the onset of credit distress. FCN calls those segments Corporate Finance and Restructuring and Forensic Litigation Consulting. To quote from the company’s 2017 10-K filing “We represent underperforming companies that are debtors-in-possession and lenders…we provide independent litigation consulting, including bankruptcy and avoidance litigation…[and] advise our clients in response to allegations involving the propriety of accounting and financial reporting, fraud, regulatory scrutiny and anti-corruption.” In fact, the company has been named as the number one restructuring advisor in bankruptcy advisory for the last ten years by the Deal Newsroom. The table below summarizes the rapid acceleration in the company’s most recent quarter which suggest to me that the credit distress showing up in credit default swaps may also be driving improvement in FCN’s two main businesses. 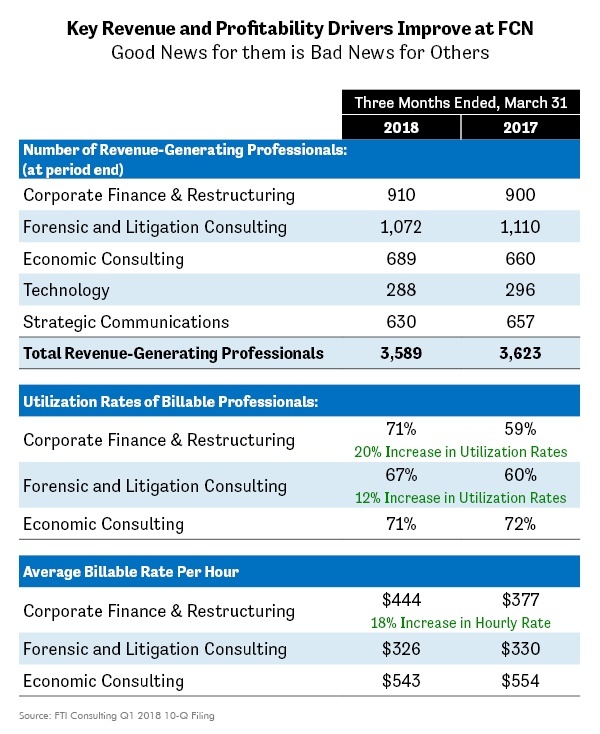 Restructuring advisory revenues rose 35% year over year in the quarter powered by a 20% increase in utilization rates of billable employees and an 18% rise in their billable rate/hour. The Forensic division saw sales rise 15% year over year in the quarter as utilization rates rose 12% on a relatively flat billable rate. These seemingly stunning numbers are leading to rapid profit growth (adjusted EBITDA) of 237% and 90% respectively in the company’s Restructuring and Forensic divisions. Am I the only one that sees in these results the proof that credit distress may return? It may be time for many aggressively positioned investors to make their investments more safe, as we have been doing for weeks. We believe that our fundamental research has potentially identified in FCN another defensive investment that gets us long the solution. 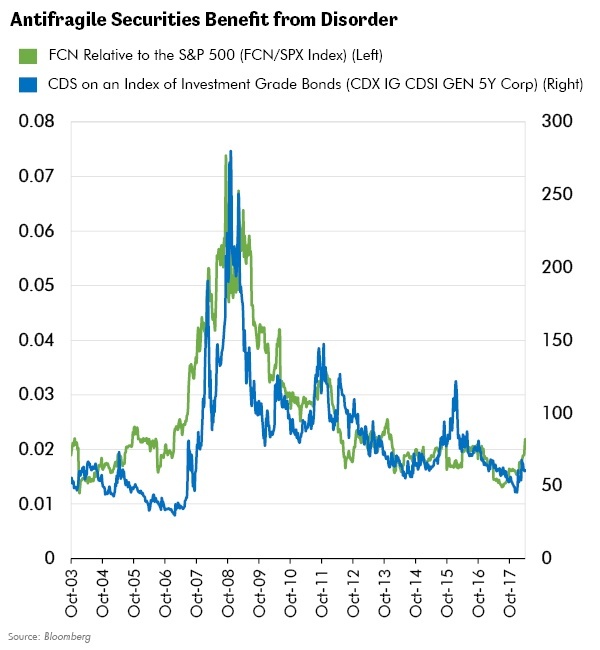 Our research suggests that FCN may be an antifragile investment that profits from rising disorder and credit distress in an ideal trade structure. Unlike the sad fate of the coalmine canary, who perished at the earliest indications of trouble, our credit canary is singing with renewed vigor as demand for its services rises as the poison in the credit atmosphere intensifies. Should our credit markets - already the most highly leveraged of all time - continue to suffer from deteriorating credit quality, our expectation is that FCN will continue to show its investment merits. "I want to know where I’ll die so I’ll never go there." "Antifragility is beyond resilience or robustness. The resilient resists shocks and stays the same; the antifragile gets better." "Simplicity is complex. It’s never simple to keep things simple. Simple solutions require the most advanced thinking." "The price of peace is eternal vigilance." "Therefore, keep watch, because you do not know on what day your Lord will come." "If there is something in nature you don't understand, odds are it makes sense in a deeper way that is beyond your understanding. So, there is a logic to natural things that is much superior to our own." "Some things benefit from shocks; they thrive and grow when exposed to volatility, randomness, disorder, and stressors and love adventure, risk, and uncertainty." "I want to live happily in a world I don’t understand."